The Calgary Science School is hosting a free PD event for Physical Education teachers on Monday, September 23, 2013. We feel that much of our work as PE teachers is in isolated and unique situations - whether it is the physical building, the location of our school, the mandate/philosophy of our respective schools and so on. We also feel that each of us possesses experience and teaching resources that might be of benefit to other PE teachers. With that in mind, we are inviting any interested PE teachers to join us on September 23th for a day of professional development. We are viewing this day as a way for our PE teachers to share what they do in their PE programs and how they do it, as well as a way for our teachers to create a professional network. The Calgary Science School will host this event; however the purpose is to allow for presentations from any attendees. Our grade 9 team recently completed a cross-disciplinary 'challenge-based learning' project as part of an Apple/New Media Consortium international research study. 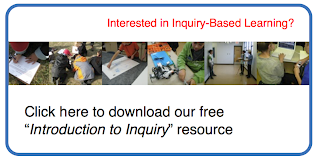 Challenge Based Learning is an approach to designing classroom work with many similarities to inquiry-based learning. CBL involves students engaging in real-world issues, conducting data-collection and analysis, and then designing and implementing a solution to an issue. Objective: Students work as true scientists through rigorous scientific exploration and experimentation. The Project in a Nutshell: Test and compare the water absorbency of yellow (healthy) pine and blue (fungus-stained) pine wood. How it came to be: One our parents approached me about taking on a special project that was brought to her attention through a fellow member of ABEC: Alberta Building Envelope Council. The Council focuses on the building envelope, which basically means keeping the outside out and the inside in. The idea is not necessarily to look for energy alternatives, but to reduce energy consumption in the heating and cooling of buildings.